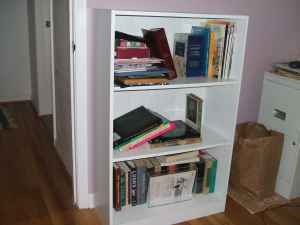 I no longer need my super trendy white bookshelf! This hipster-chic piece can be used to display a variety of items aimed at impressing your super uppity friends!! $30.00, you pick-up (I can help load), cash only (yada, yada, yada...you know how CL transactions work). That bookshelf is not worth more than $10. I feel like we are at a point in our lives where we really don't have to pay for crappy furniture--people have too much and it is given freely.